Content marketing is a long and a vigorous process and has a lot of moving parts and more than often you'll have those light bulb moments, those ideas which you forget. 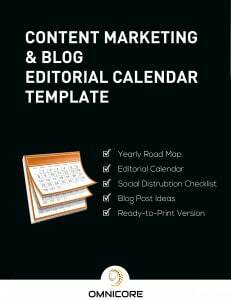 We've prepared a Complete Blog/Content Editorial Calendar Template and Cheat Sheet which you can use to take your content marketing efforts to the next level. Social Media Distribution Checklist because content creation is just half the battle. Yearly Roadmap to Set Budget, Goals and Expectations while keeping track of events and important launches. Print Version so you can use at your office or workplace. So, Are you ready to embrace content marketing this year? Get our free Editorial Calendar.